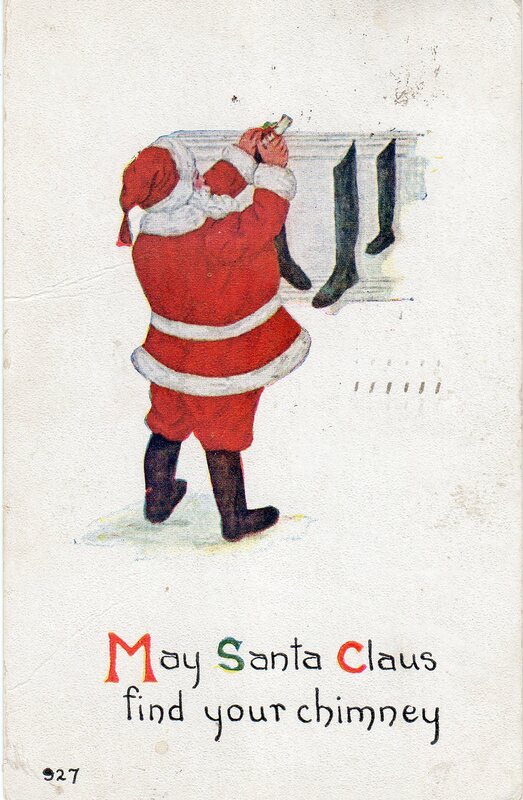 This lovely 1909 Christmas postcard was sent by Carrie Vollmar of Berlin, ON, to Pearl Bracey of Bridgeport, ON, on 22 December 1909. Pearl Bracey was born in Bloomingdale, ON, on 24 July 1887, to William Bracey and Louisa Snyder. She lived in Lexington and Bridgeport during her lifetime. She was a member of Trinity United Church, Kitchener and, at one time, served as the organist for Emmanuel United Church in Bridgeport. She died on 19 January 1977 in Kitchener, at the age of 89. 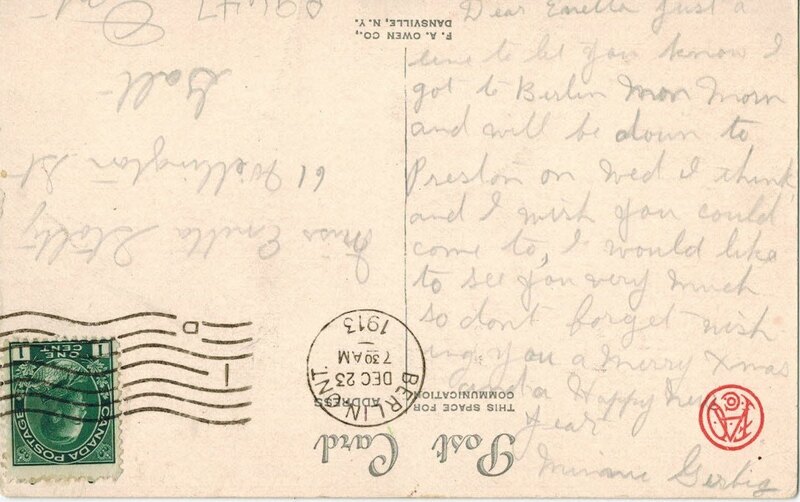 Carrie (Caroline Marie) Vollmar, the sender of the postcard, was born on 12 July 1884 in Berlin, ON, to Daniel and Catherine Vollmar. She married Henry O. Knechtel on 9 June 1917, at the age of 32, in Kitchener. She and Henry had one child, Esther Catherine Knechtel (married name Boyer). Caroline passed away on 25 December 1945, at the age of 61, in Kitchener. The postcard features a colourized photograph of skiers enjoying a winter afternoon. It made me think of the many Christmas Days that I have spent walking, tobogganing and exploring with family and friends. From sledding with my daughter, walking with my Mom and grandmother, to a magical moonlit hike through silent fields with my uncle and cousins, Christmas Day has always been a special time to connect with family, friends and community. I hope that everyone is able to enjoy the holidays and reconnect – with the things, people and activities that bring them joy. From all of us in the Grace Schmidt Room, we would like to wish you a Merry Christmas and the Happiest of Holidays. 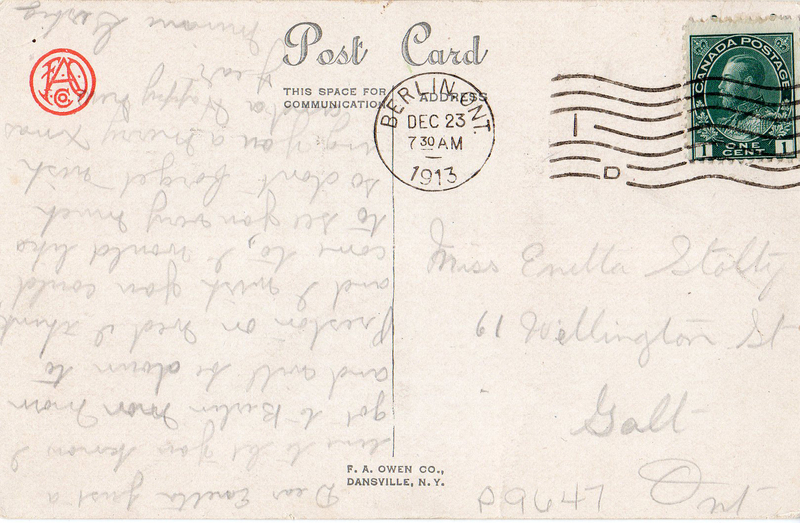 As the holidays are upon us, I wanted to share this Christmas postcard, mailed 100 years ago today, from Berlin to Galt. It was sent by Minnie Gerbig to Enetta Stoltz of Galt. I love its simplicity and quaint message. From all of us in the Grace Schmidt Room, have a happy, safe, and healthy holiday season! Just a line to let you know that I got to Berlin Mon Morn and will be down to Preston on Wed I think and I wish you could come to, I would like to see you very much so don’t forget wishing you a Merry Xmas and a Happy New Year.